Quicker Than the Eye…not just a clever title. When it comes to Ian Quick, it’s a statement of fact. Filled with laughs, thrills and jaw-dropping effects, Ian Quick injects his unique personality and charm into the world of magic. From grand illusions to “one-on-one” sleight of hand, “Quicker” Than the Eye presents a wonderful blend of mirth and mystery for the whole family to enjoy. Furthermore, this stage show offers an experience rarely felt in large illusion shows...audience participation!!! For the first time, the lovely assistance is played by audience members for most of the show. “Quicker” Than the Eye is a stage show perfect for all lovers of magic, from ages 8 to 88! This show offers two 40 minute acts with an intermission. Ideal for cocktail parties or working the crowd at festivals and other large gatherings! Walk-around magic offers plentiful presentations of perplexing prestidigitation. In other words, the magic happens right in your hands. What better way to break the ice and get the crowds abuzz with excitement than by offering close-up, personal entertainment to small groups as they mix and mingle the night away. No two parties are alike, so why should your entertainment be the same old thing? Corporate shows and private functions should enjoy presentations tailored to their needs, whether it’s a question of scope, duration or special theme. 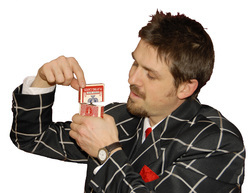 The Magic of Ian Quick is proud to offer custom magic shows. It’s the perfect way to entertain your audience, whether it’s a small stage function, an after dinner banquet performance, or a festival event. Marketing is all about catching people’s attention with your product or service and holding on to it. What better way to catch the eye than to play tricks on it? Trade show magic can give you the edge by “wowing” potential clients with a unique trick or routine involving your product. Traffic stopping tricks right at your booth…think about it!